The Forced migration of Africans during the 1450-1750 brough about many developments. These include developments in art, the social spectrum, politics, and innovation. The African culture began to blend with the cultures of the Americas and Europe, especially in art as well as politically and socially. However, the forced migration of Africans had a negative effect on the innovations of Africa. "The past is what makes the present coherent, [the past] will remain horrible for exactly as long as we refuse to assess it honestly." enough money to purchase their, and their families', freedom. In addition to 2-D and 3-D mediums, African music also had a great impact on the Americas. Rythmic slave songs became quite popular among the people. Some of these songs are still well known today, like "Go Down, Moses" and "Swing Low, Sweet Chariot". The Atlantic Slave Trade brought many slaves into the areas of Brazil and the Caribbean. 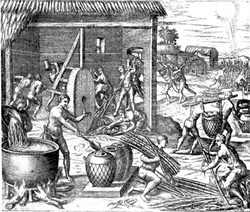 Europeans used African slaves on highly productive sugar-producing plantations. Because of the influx of Africans, a social system of classes evolved. Peninsulares (European born Portuguese) at the top, followed by creoles (Portuguese born in America), mestizos (Portuguese/Native), mulattos (Portuguese/African), full Africans, and natives. Light-skinned free blacks and mulattos had many opportunites and found positions as political leaders, scholars, musicians, writers, and artists. In contrast, North America had a sharply defined racial system. This system placed people of white color above colored people (Africans and Natives). It wasn't until the 14th Amendment that everyone was considered a citizen regardless of race. Some people believe that this racial system is still going on today in the United States. 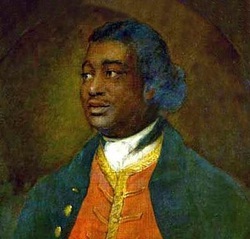 1768- Ignatius Sancho. A playwright, composer, writer and grocer. Although many slaves spent their whole lives in enslavement, there was a select few that were liberated and helped prominate positions in society. Especially in Brazil, where slaves were numerous and slave owners more willing to free them, ex-slaves had greater oppurtunity for political advancement. One visitor to Brazil was surprised to find a darker-skinned man serving as local officical. When he asked about him being a mulatto, the reply was, "He was, but he isn't anymore. How can a governor be a mulatto?" 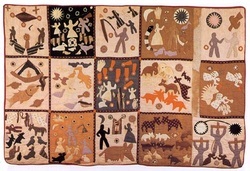 In North America, the forced migration of Africans led to a politically seperated United States. The southern U.S was home to many African slaves, whereas the northern U.S had fewer slaves. Because of this seperation, the U.S fought for power in Congress which led to tensions between the north and south. And this, in turn, led to the United State's Civil War. Back in Africa, the continent was drained of competent leaders and was often left to corrupt heads and chiefs. In addition, other leaders made poor decisions concerning its people, which led to fragmented, weak countries. The African Slave Trade slowed down the growth of Africa becasue of the great amounts of people forced to move to the Americas and Europe. While Africa was slowing down, China, Europe, and other regions were growing demographically. Sub-Saharan Africa represented 18 percent of the world's population in 1600, but in 1900 it only represented 9 percent. Innovation was also dramaticly slowed. As Africans became more and more relient on European goods and business, they slowed and almost stopped innovation and improving their technology. The international demand was for Africa's people, and not for its innovations. This diminished local skills. There was little need for newer innovations when one could get rich by selling other Africans. This led to a greater seperation between an underdeveloped Africa and its knowledge exploding counterparts, Asia and Europe. 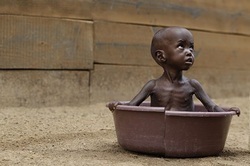 It is because of this lack of innovation that Africa today is greatly behind the rest of the world in development.